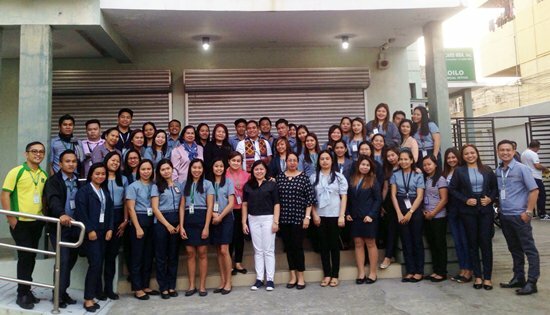 Dr. Alip together with Dr. Dolores M. Torres, senior management adviser of CARD Bank, Flordeliza L. Sarmiento, managing director of CARD MRI, and some management committee members of CARD MRI with CARD Bank and CARD MBA staff in Iloilo on January 16, 2019. SAN PABLO CITY – A total of 3,175 scholarship slots will be provided by the four major institutions of CARD Mutually Reinforcing Institutions (CARD MRI) namely CARD, Inc., CARD Bank, CARD MRI Rizal Bank, and CARD SME Bank, to its microfinance clients and their dependents this academic year 2019-2020. Microfinance clients of these institutions who are at least three years in membership until May 2019 with 100% repayment rate and 90% attendance rate during weekly center meetings may have themselves or their children take the national qualifying exam on February 9, 2019. The scholarship slots are also available for those who are savers of the institutions for at least five years. “Education is one the social development efforts CARD MRI values for more than three decades now. With access to education, our fight to end extreme poverty in the Philippines would be made possible,” said Flordeliza L. Sarmiento, managing director of CARD MRI. Prior to taking the exam, an accomplished application form must be filled out, which can be secured in any CARD offices nationwide. The exam will run for one hour only. Designated testing areas are already posted in CARD’s respective offices nationwide. CARD MRI has scholarship slots for high school, senior high school, and college. The senior high school slots, however, are only allotted for students who will enroll at CARD-MRI Development Institute (CMDI) in Bay, Laguna and Tagum, Davao davao del Norte campuses. All the slots are open for the children of CARD clients. Those clients who intend to finish their schooling may also take the exam for the Balik Eskwela program. Qualified high school scholars will receive P3,000 yearly, senior high school scholars at CMDI will receive P17,500 per year, while college scholars will receive P12,000 per year. Every scholar will receive a financial support for maximum of four years. The One Family, One Graduate program was launched by CARD MRI in 2016 to ensure that for every family the CARD major institutions serve at least one will graduate from college. In 2015, CARD MRI through its then training center the CARD-MRI Development Institute (CMDI), was granted by the Commission on Higher Education (CHED) to operate as secondary and tertiary institution. CMDI established campuses in Tagum City, Davao del Norte and Bay, Laguna to provide quality education to deserving students. High School and Senior High School scholars are encouraged to enroll I the two campuses as more scholarship opportunities for college education from CARD MRI await them in the college. “We are planning to open more campuses in the coming years to accommodate more students and promote microfinance and development-related courses,” said Sarmiento. As of December 2018, CARD MRI has supported 12,465 scholars nationwide where 4,816 already graduated in college.